Office cuts at Wieden+Kennedy? Yep, and they're big: WORKac pierced the floors with two circular apertures to connect the levels at the New York ad agency. The resulting renovation, a 4645-m2 three-storey space designed by architects Amale Andraos and Dan Wood of WORKac, emphasizes work over play, focus over frivolity, and congeniality over preciousness. W+K's wish to encourage circulation from one floor to another informed two major features of the project. Two circular apertures were cut into the floors between storeys to house staircases. The use of circles instead of squares shaved off square metres, freeing them for other purposes. The lower staircase, the more ambitious of the two, is called the Coin Stair. Another circular form, the staircase itself doubles as small auditorium and informal meeting place, while providing a seating area on the underside. 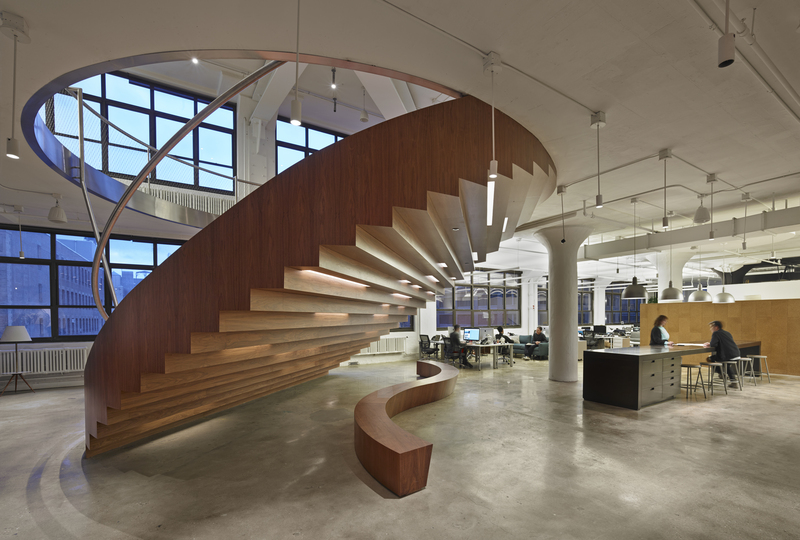 Not only a feat of design, the Coin Stair proved to be an engineering challenge as well. The large opening required the insertion of a nearly 100-tonne asterisk-shaped steel structure to stabilize the surrounding architecture. It took three months to install. One column was removed to accommodate the Coin Stair. Thanks to the new structure, the four floors above can support the approximately 975 kg per m2 for which the building was originally designed, even though the modern office typically requires much less for normal activity. The second, smaller aperture contains a spiral staircase that ends in a library. 'This idea of subtraction is really interesting to us,' says Andraos. To read more about WORKac's mammoth renovation, watch out for our in-depth Case Study on the project in Frame 99, due out 1 July.